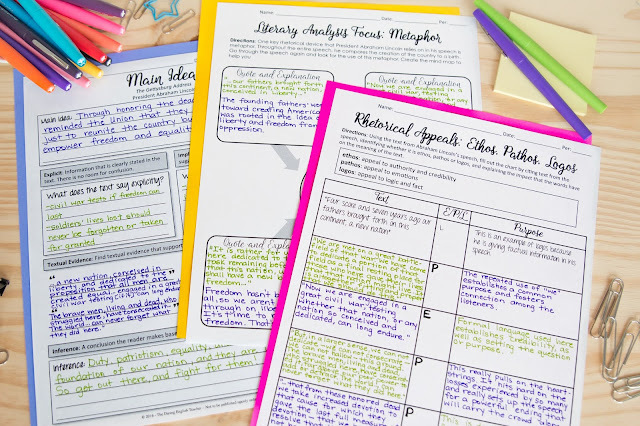 Teaching rhetorical analysis is one of my absolute favorite units to complete with my students. 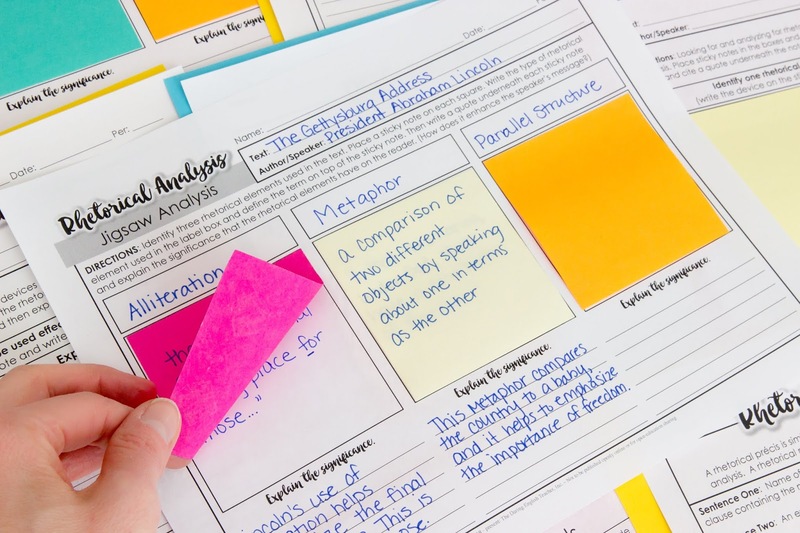 I love teaching my students about rhetorical strategies and devices, analyzing what makes an effective and persuasive argument, and reading critical speeches with my students. Here is a list of some of my favorite speeches to include in my rhetorical analysis teaching unit. This is usually the first speech that I analyze with my students during our rhetorical analysis unit. I take a couple of days to annotate it and analyze it with my students. This is a great speech to use when introducing rhetorical analyze to students because it is short. You can easily read the speech and analyze it in one class period. Some notable things to mention in this speech include allusion and parallel structure. To make your analysis more meaningful, point out these devices to students and explain how these devices enhance the meaning of the text. This speech is one that many of my athletes love to analyze, and it is an excellent exemplar text to teach pathos. And like The Gettysburg Address, it is short. 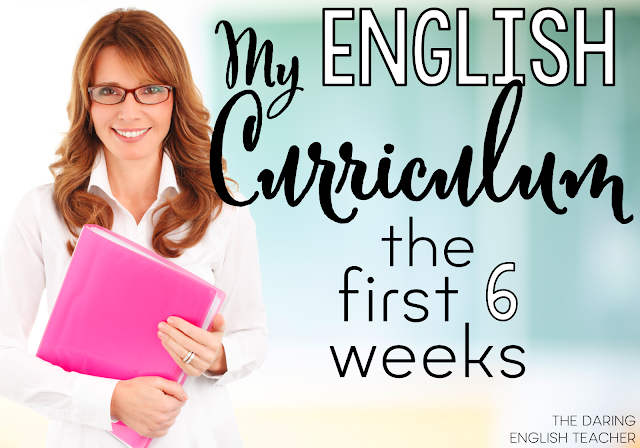 This is another speech that you can read, analyze, and even write about in one class period. When I use this speech in my class, I have students look for examples of pathos. Mainly, I have them look at word choice, tone, and mood. 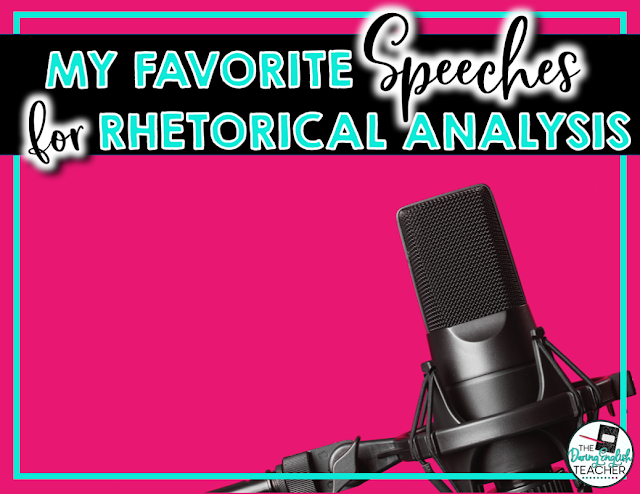 How does Lou Gehrig’s choice of words affect his tone and the overall mood of the speech? This speech is one of the most important ones your class could analyze, and most students are most likely familiar with the content of it. This speech is a little longer than the other ones, but as the speech is relatively familiar, the analysis and annotation of it should not take any longer than a couple of days. In the classroom, it is important to point out the sermonic feel to the speech and also to have your students look for calls to action and pathos. Have your students look for tone, allusions, and word choice to help them notice these rhetoric expressions throughout it. This is another important speech that held a lot of importance for the changes that needed to be made in America. 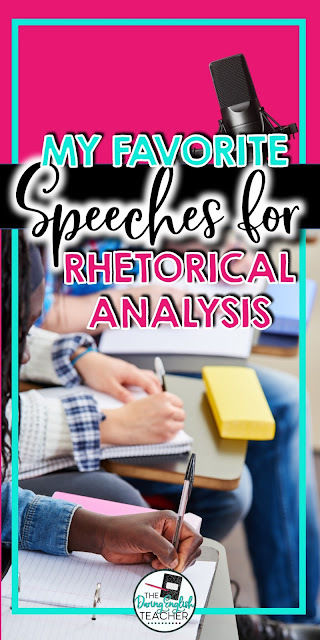 The speech is a shorter one, so in the classroom, it will not take as long to analyze it, and students can understand the significance of the use of rhetoric in a shorter amount of time than some other speeches. When teaching this speech, I like to remind my students to search for devices that portray an excellent example of the pathos that is so present in this speech. Some of these devices could be mood, repetition, and diction. Students will enjoy reading this speech, that makes excellent use of the rhetoric and also hopefully inspires them through the words Jobs said. The speech is organized in such a way that it is easy to analyze, as each point is explicitly expressed in a specific order. Jobs uses a lot of ethos to express his opinions, especially as it is a commencement speech and he is meant to inspire from his position in society. In class, it is good to have your students annotate and analyze the speech just as they have done for the others. 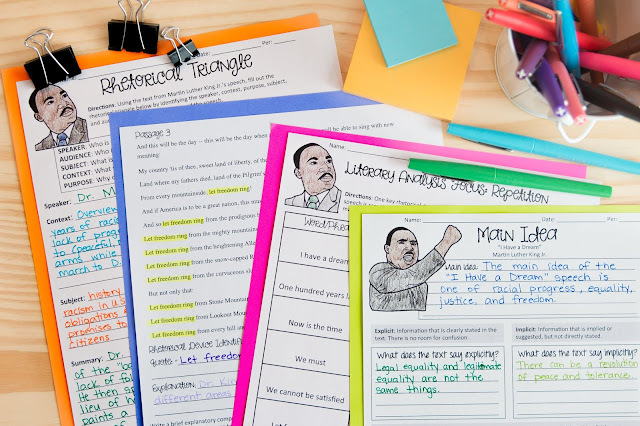 The organization of the speech will help them to notice the similarities and differences between each point Jobs makes. This speech represents a strong sense of pathos as a movement to help the American people cope with loss after the deaths of the astronauts aboard the Challenger. 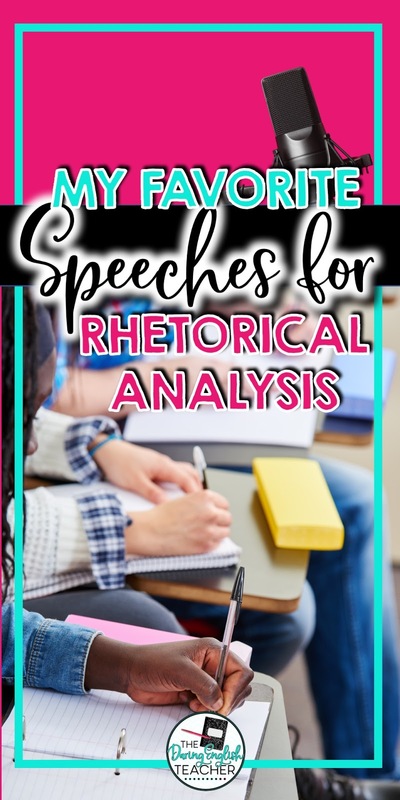 It is another speech that is not too long, so it should not take a long time to both analyze and annotate the entire speech. When teaching this speech in class, be sure to mention how pathos is the driving force behind the speech, through the tone and the diction. How does Reagan use emotion to focus on the astronauts as humans, rather than solely focusing on the tragedy? This speech is a good one to teach because it both makes students question their own lives, but also how the world works. The speech relies on pathos, and a little ethos too, to get the audience to feel the full effect of the tragedy of the Holocaust and what the speaker went through. It is a long speech so it may take longer for the students to fully grasp all the details that make it such a persuasive speech. When I teach this speech, I like to have students annotate every place they notice an example of pathos, and then have them explain why in their annotations this makes them feel an emotion. The same with the ethos, and then we can further analyze the rest together. This speech shows another example of the use of pathos in the midst of a tragedy. The President wanted to show the American people how much he was feeling for those lost in the tragedy of 9/11. It is not a long speech, but the amount of emotion within the words is significant for students to notice. When teaching this speech, it is essential that students look very closely at each part of it, noticing each piece that reveals tone, mood, and other literary devices. How do the different devices add to the pathos of the speech? This speech is probably the shortest speech on this list but provides one of the most emotional and pathos-filled rhetoric. This describes another tragedy that is spoken about with pathos to give the audience a safe feeling after such an emotional thing. Students can spend time analyzing the different devices that make the piece so strong in its emotion. In the classroom, make sure your students make a note of the repetition, and what that does for the speech. Does it make the emotion more impactful? How does it make the audience feel like they are a part of something bigger? This is another short speech that holds a lot of power within it. A lot of students will enjoy reading this to see how much the country has changed, and how this speech may have some part in influencing this change. It is a great speech to help teach logos in the classroom, and it will not take a long time to analyze. Make sure your students notice, and they also understand, the use of allusions within the speech. These allusions help to establish the use of logos, as Anthony wants the use of American historical documents to show how logical her argument is.